Day-to-Day Needs - Trentham. Cool country. 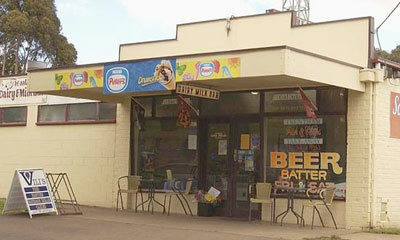 Address: 28–30 High Street, Trentham. Local and red gum – Free delivery. Ricky delivers both redgum and local firewood around the Trentham area, either whole or split. Ricky's wood is stored under cover and ready to burn. Hardware, Plumbing fittings, Paint, Tools, Plants, Garden Tools, Heaters, Tanks, Stock Feed & Gas Deliveries. If we haven't got it we'll get it, so please ask! Open seven days: Mon-Fri 9am-5pm, Sat 9am-1pm, Sun 10am-1pm. Address: 39 High Street, Trentham. Newspapers, Magazines, Comics, Stationery, Toys, Cards and Wrapping, Tattslotto, Dry Cleaning, Colour and Black and White printing and Copying, Laminating and Fax Service. Trentham's own pharmacy! Services include: Professional service and advice, free pick-up and delivery, natural health, animal health, photo processing, gifts and perfume, Natio cosmetics, and displays of local crafts and artisans. Address: 43a High Street, Trentham. Take away food, Video Hire, Cold Drinks, Ice creams and Confectionery. V/Line Depot and Ticket Sales.